Most Improved Student. From struggling to winning an award. 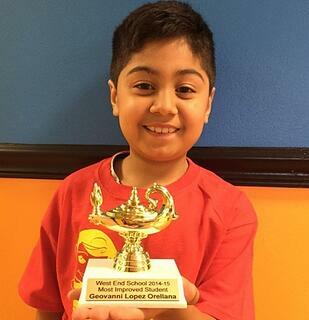 Geovanni Jr. was awarded the “Most Improved Student”award from his school. His dad credits Math Genie for a dramatic turnaround in his child. In first grade Geovanni was having a hard time with numbers. He was also was behind in reading. They received a letter from the school informing them that he was 6 or 7 levels below other kids in his class. As parents we weren’t happy. He liked math but he was having trouble with it. It was very complicated for him. He couldn’t understand his Home work. He enrolled in Math Genie at the end of first grade. He was 7 years old. Math Genie taught him to do math in a totally different way. He finally began to understand numbers. The program started opening up his mind. Homework started become easy for him. Math Genie has helped him with everything. It has opened his mind and helped him in school. Every friday he has a math test in school. It consists of 50 problems and he consistently gets above 100 on most of them. He gets extra credit for solving difficult problems. His lowest score ever was 83. Our biggest surprise has been his improvement in reading. He can read much faster now with comprehension. He loves to read. We now take family trips to the library to pick up books that he wants to read. He voraciously goes through those books quickly. His focus has improved a lot. We can see that he can read books without stopping in the middle. We are very proud to see him succeed in school. How does Geovanni compares to his peers? Other kids in his class are behind him. They have a hard time with Homework. Teachers call parents to complain. There is only 1 kid in his class who Geovanni considers to be on the same level as him. According to him all the rest of the kids are way behind. What would you tell parents who are thinking about enrolling their child in Math Genie? It is a very good program. Just do it!